Last year, my mother used her Amazon credits to buy the original Kindle. I went to visit her in June and she gave it to me. She had trouble figuring it out and decided she’d rather read her traditional books. Lucky me, I get to play with it now. I’ve pretty much fallen in love with it, and take care not to damage it. I’ve been using the black leather case, but I’d rather have something less bulky. I decided to knit a case! Surprise! I pulled out some colorful old yarn, Caron Simply Soft Embroidery Print. This yarn is slightly thicker than the regular Caron Simply Soft Yarn. I love the bright colors and have made some eye catching cat toys out of it. The pattern below is for the original Kindle. The Kindle dx is slightly smaller and the nine inch version is larger. Please adjust per size of device. Gauge 7 stitches = 1 inch /5 rows = 1 inch on size seven needles. 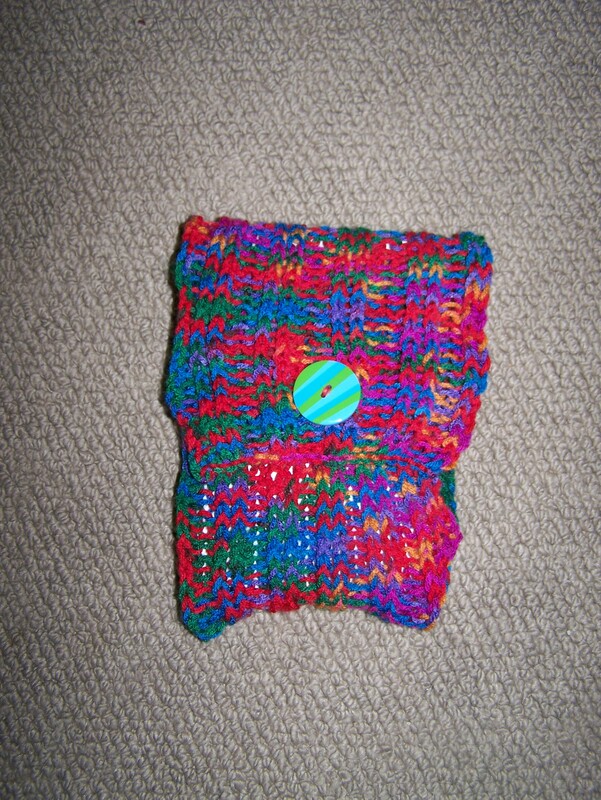 Hold aside about 3 feet of yarn for button hole. Button used is slightly over 1 inch in diameter. Row 1: K2P2, continue to end. Do this for 20 inches. K2P2 for 12 stitches (1/2 the width of case). Continue rib for 12 stitches with 3 feet of yarn placed aside earlier. 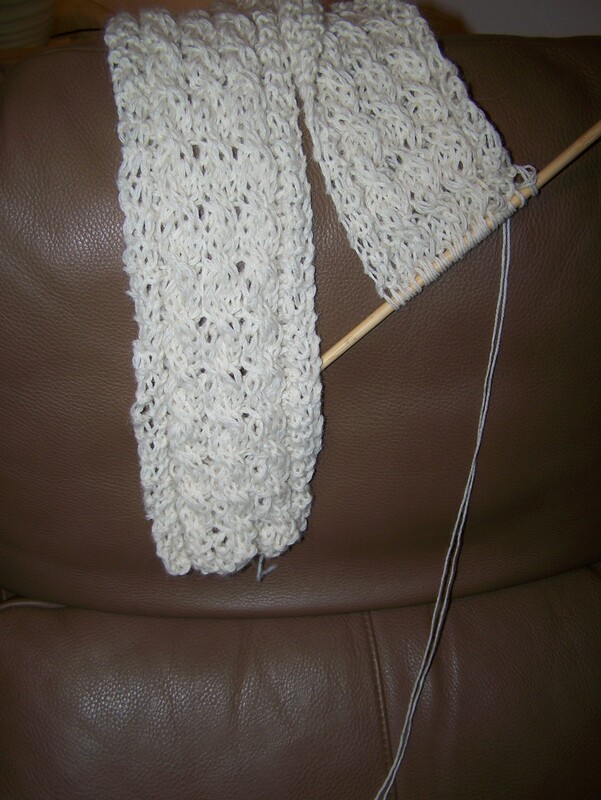 Turn work and rib for 12 stitches with short yarn. 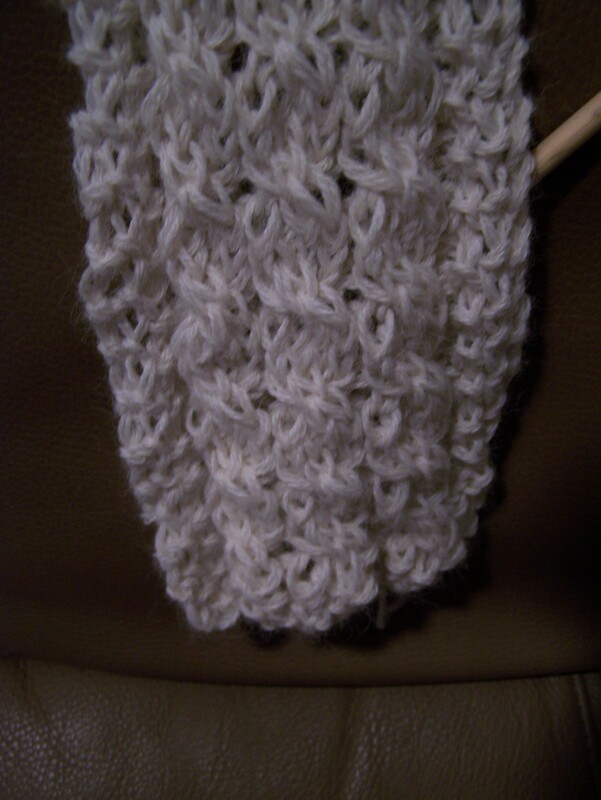 Continue with row using the orginal yarn. Do this until hole is about 1 inch in size. The hole should not be larger than the button used. Once the hole is the appropriate size, continue rib pattern for full row using original length of yarn. Continue rib pattern for an additional 2 inches. Bind off. Fold 8 inches of the material in on itself and sew the seams together. 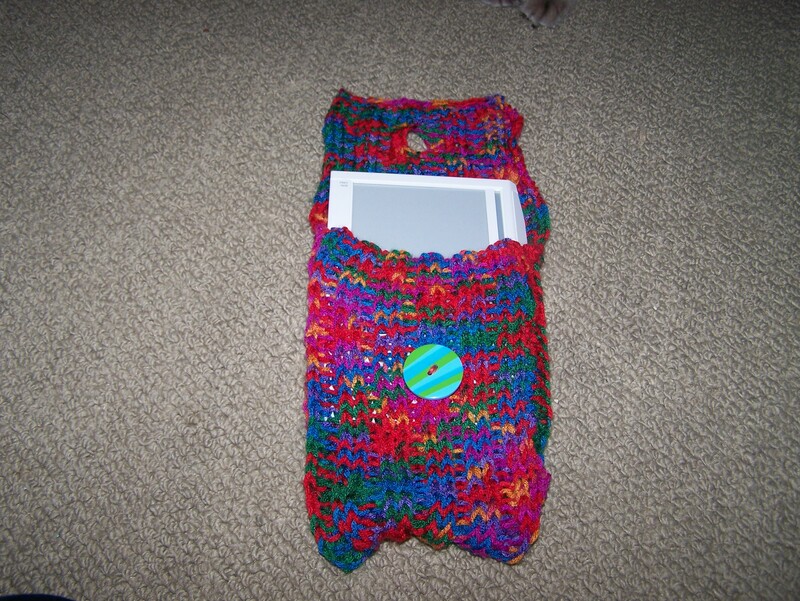 You should have approximately 6 inches to ‘fold over’ the case with the button hole in place. Flip the case inside out so that the seam binding is on the inside. Sew the button onto the front panel about 3 1/2 inches from the top. Check your button hole location before adding button. Insert Kindle and have fun!!! To all who knit, crochet, or simply peruse, Merry Christmas. May your stockings be filled with needles and knickknacks and your yarn plush. May projects be plentiful and the ideas unending. 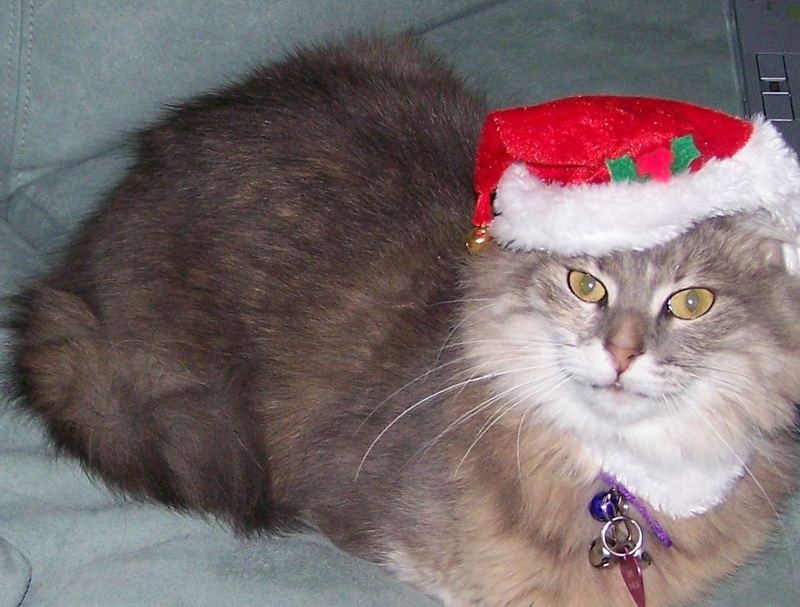 May your family be warm with fuzzy, soft, colorful accessories. Merry Christmas to all and to all a good knit! Sorry I haven’t been around lately. After the wedding, the visitors, the honeymoon and the job stress, I wound up taking a small hiatus from knitting. I made some Christmas ornaments for family members. Now, I’m preparing to go back to NY for Christmas and while they enjoy their snowstorm, I know I am going to freeze. Living in Southwest Florida has been a blessing for me, but has spoiled me to cold weather. I used a pattern from ravelry to make a floppy beret to keep my head warm and wanted to make a scarf that would go. This is my Triple Cabled Scarf made with Plymouth Alpaca Prima yarn double strandled with size 10 straight needles. I am in love with this scarf! The yarn had been in my collection for well over a year, waiting for the perfect project. Thank you Gabriella’s Yarn Shop for this! She no longer has this in stock, but she has many many great yarns. C4F = hold 2 stitches to front with cable needle. Knit 2 from left needle, then knit 2 from cable needle to create left twisting 4 stitch cable.